Cockroaches have been on the planet for a very long time. Their evolutionary success hinges on their simple biology. Some species feed on just about anything including each other. When there exists an abundance of food, cockroaches multiply even faster and as such large infestations can quickly develop. Cockroaches contribute to health problems. Their carcasses and droppings are recognised triggers for children and adults with asthma. They are also responsible for aggravating allergies. So eliminating them from the home or business is essential. The Gisborne cockroach is the main urban pest species is found in the Kapiti to Manawatu area. White or cream stripes running down the sides of their bodies are the identifying marks. For every cockroach spotted in your home there is a high likelihood there will be many more hidden away. In this region it’s a little just too cold outside for the germ carrying American cockroaches. On occasion German cockroaches are encountered. Identified by two black stripes running from the head to the abdomen. They flourish mainly in the kitchens, around hot water cupboards, at the back of a fridge around the compressor or motor or in a building where there is a lot of warmth, like bakeries. They love to live inside coffee machines. Other species of cockroaches found in this area include bush or native wood cockroaches. These can congregate in large numbers outside the home and if they do happen to come into homes it is less likely for food and more likely to avoid any wet weather. As nocturnal creatures they are rarely seen during the daylight hours, and more likely to appear at night especially when you turn on lights in a dark room. Of course if you do happen to see them during the day it’s likely due to overcrowded populations or a heavy infestation. Once spotted, cockroaches move very fast and by their nocturnal nature they quickly seek out darkened areas to hide. They also successfully move between rows of flats or apartments, using plumbing and pipes as their freeway. 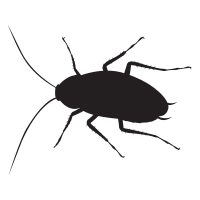 If you detect a distinctive mild "musty" odour, it’s possible you have an infestation as cockroaches secrete a number of distinct odorous compounds. Until recently cockroach gel baits had been the treatment of choice and were used extensively throughout the Kapiti - Manawatu area. Surface spraying can be of limited use as cockroaches can quickly learn to navigate around treated areas. Needless to say, eradication is difficult and it requires expert knowledge, equipment, and materials. It is also essential, before any treatment, to first identify the cockroach species being targeted. German Cockroaches (Blattella germanica) - the bad ones to watch out for in the kitchen. As a positive, the science of cockroach control is moving fast. New age methods are being developed and implemented, methods that are specially formulated to ensure safe cockroach eradication around and in food related premises. These include recently designed targeted film applications and controlled release microcapsules. This new technology is designed to lure cockroaches to a treatment area whereby they absorb the treatment as they walk on it. As cockroaches congregate and socialise they unwittingly transfer these microencapsulated treatments to each other. When you see the first cockroach or if you suspect you have an infestation, make sure you get the right information, and the right treatment. Don’t hesitate; contact us at Nature’s Way.